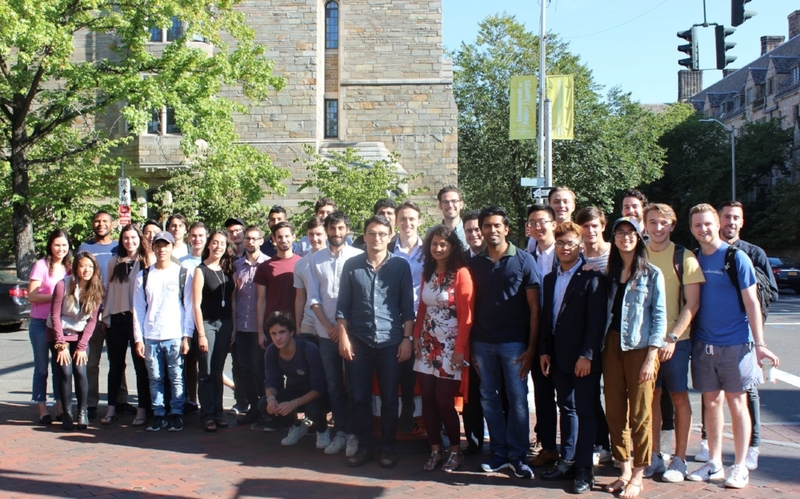 The Tsai Center for Innovative Thinking at Yale has initiated the first cohort of teams into its Accelerator Program – a 6-week program for testing and developing new startup and nonprofit ideas with funding, workshops, mentorship and peer coaches known as Innovation Advisors. Tsai CITY provides resources for students from all academic backgrounds who want to take concrete steps to launch an idea – for-profit or nonprofit- and is supported by a significant donation by Yale alum Joseph Tsai (’86 B.A., ’90 J.D.) cofounder and executive vice chair of Alibaba Group. There is no shortage of big, transformative ideas among the 19 admitted teams. Alectro, led by two Yale College students, seeks to transition the nation’s railway system to renewable energy by integrating adjacent land with solar modules. Another team led by a student at the Yale School of Public Health wants to make it easier for women to access emergency contraception. And Firoz Academy, combining efforts of Yale College and Yale Law School students with Yale alumni, is looking to close the education gap in Afghanistan by offering high level skills-based training at low cost. Among the admitted teams are a few ventures on an advanced track that have already progressed beyond early-stage discovery. These teams, which are poised to seek funding or are in need of a board, will be connected with additional resources to help them progress. They include Penta, a social venture that has been perfecting a scalable and transparent system to collect used, high-quality prosthetics from patients and clinics in the US, ship them to developing countries in Southeast Asia, and match them with those in need. Another startup in the accelerator, Snackpass, is an app already widely used by Yale students and New Haven businesses. It allows you to order ahead and get discounts at your favorite restaurants. “We want to meet teams where they are at and provide the specific resources they need to accommodate them as they grow,” says Walker Harvey. All teams in the Accelerator program will benefit from the guidance and mentorship of students known as Innovation Advisors – graduate students with experience in business, entrepreneurship, science, marketing, social entrepreneurship and other relevant skills. As part of the experience, they’ll be encouraged to provide updates and field questions from fellow Accelerator students, and to learn practical steps to advancing their ventures from CITY staff and visiting experts. Team: Farouq Ghandour (YC), Omar Zaki (YC), Andrew Suiter, Jon Langel. Alectro’s mission is to transition the railways to renewable energy by developing the land adjacent to the railways with integrated solar modules. Building a pipeline between students and campaigns in need of staffers. Building a coworking space in Sri Lanka that’s focused on building a supportive startup community while also providing access to subsidized HR, accounting and concierge services. A quick, easy, and convenient way to update the paper flowchart that many organizations use to decipher the maze of locating emergency contraception in a timely manner. A scalable SaaS solution for K-12 public school districts, designed to increase efficiency in administrative compliance activities. Connecting consumers, investors, and businesses, Epoch creates a banking ecosystem around decentralized currencies and assets. Face to Face aims to help bridge the increasingly pronounced division in American society along lines of race, class, political ideology, ethnic background, and identity. Firoz Academy imparts practical skills that give students in Afghanistan a competitive edge in the global labor market. Incentivizing Ethiopian farmers to increase their commercial orientation to producing non-timber forest products. Munch Scout is a photo-centric social media platform made exclusively for foodies. Providing an efficient and simple system to transport unused food from food businesses to nonprofits. Buildings always need repairs – Paragon is an online marketplace that makes it faster and cheaper for buildings to find contractors, compare bids, and manage work through completion. Penta’s nonprofit branch collects used lower-limb prosthetic devices from clinics and individuals in the United States and distributes them to patients who otherwise would be unable to afford them. QuietBreeze is a window attachment that lets fresh air through, but blocks outside noise. A social enterprise committed to increasing land stewardship and food and health sovereignty amongst people of color. Snackpass allows users to order ahead, skip the line and connect with friends by sending a gift. The Shift is a multimodal transportation hub, a space where high-speed and regional rail, AVs, conventionally-operated vehicles, bicycles and the like come together for increased efficiency. Diverting methane-emitting animal byproducts, animal waste, and food waste from landfills while generating renewable biogas and rich fertilizers in the process. Visionairy Health is developing the world’s first platform for the automated screening of medical images - an AI based software that can screen chest x-ray images for abnormalities.